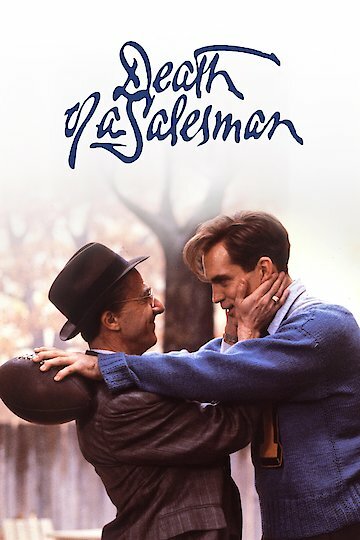 Death of a Salesman is a 1985 film based on the 1949 play written by Arthur Miller. Willie Lomax (Dustin Hoffman) is a mentally unstable, unappreciated salesman, who is worried about his sons, Biff (John Malkovich) and Happy (Stephen Lang), who are still meandering through life as adults without having accomplished much. Biff is a high school football star that failed to go to college. He is happily content and has dreams of being a farmhand. Happy is a womanizer and has a dead end job as a store buyer. Willy is dumbfounded to as why neither of his sons want to follow in his footsteps. Willy's erratic behavior gets worse and his boss, Howard (Jon Polito) fires him from his job. Willy seeks advice from his neighbor, Charley (Charles Durning), but runs into Charley's son, Bernard (David S. Chandler) first. Bernard tells Willy about a trip Biff had taken to Boston to visit Willy and something transpired to change Biff's mind about many things. Willy reminisces about that day in Boston, and it is revealed that Biff found out about a young woman Willy had taken along with him on his business trip. That revelation changed Biff's opinion of his father forever. Biff is in a state of frustration after having met with Willy and Happy. He goes home and faces his angry mother, Linda (Kate Reid), who feels that Willy has been abandoned. Willy's mental state is worsening. Biff attempts to reconcile with his father, who cannot seem to let go of the dreams he has for his sons. Biff wants a normal lifestyle, doing what makes him happy. Willy misinterprets he and his son's reconciliation, and believes Biff wants to go into business. Willy purposefully crashes his car and kills himself so that his family can receive the insurance money. Biff still opts not to go into business, while Happy chooses to follow his father's career. Death of a Salesman is currently available to watch free on Tubi TV and stream, download on demand at Amazon online. The veteran actor allegedly groped and harassed a 17-year-old production assistant.